White paper on crime 2004 Part4/Chapter1./Section1/2. Fig. 4-1-1-3 shows juveniles cleared rate per1,000population for non-traffic penal code offenses by age group since1966(see Appendix4-2 ). 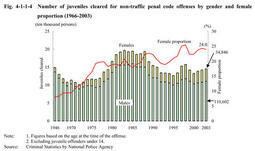 Since1984,juveniles cleared rate per population has been always the highest for junior juveniles,followed by intermediate juveniles,senior juveniles,and juveniles under14.Their recent rates in all age groups peaked in1998and then decreased before rising again from 2001. Fig. 4-1-1-4 shows the proportion of females to the total juveniles cleared for non-traffic penal code offenses.The female proportion,which has been on the rise from a long-term perspective,fell by0.4from the previous year to 24.0%in2003.